All four Division Series are now two games in, with three teams standing out as World Series favorites, three teams staring into the abyss, and two suiting up for a protracted battle. With their second consecutive victory over the Arizona Diamondbacks, the Los Angeles Dodgers have joined the ranks of the Cleveland Indians and Houston Astros as heavy favorites to advance to the League Championship Series. For seven innings yesterday evening, it seemed as if Chicago would be joining the party as well, but Bryce Harper and Ryan Zimmerman had other ideas. 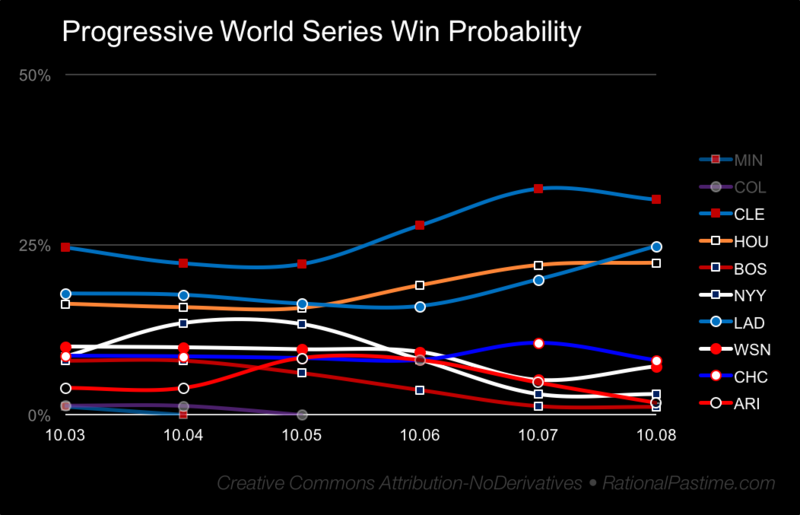 The Washington Nationals and Chicago Cubs are now neck-and-neck in DS, LCS and World Series probabilities. 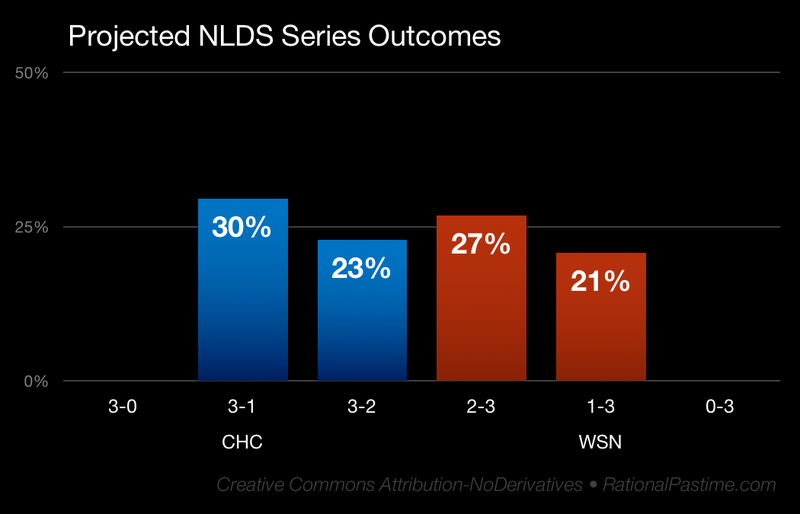 The Nats and Cubs will head to Chicago for game three with the Cubs very slight favorites, 52-48%. Chicago's best hope is to win the next two and finish it off at home, while the Nationals would do best to force a fifth game. The Diamondbacks, on the other hand, head back home fighting for their postseason lives. The Dodgers are heavy, if not insurmountable, favorites, with a 50-50 chance of finishing off the series in game three tomorrow. 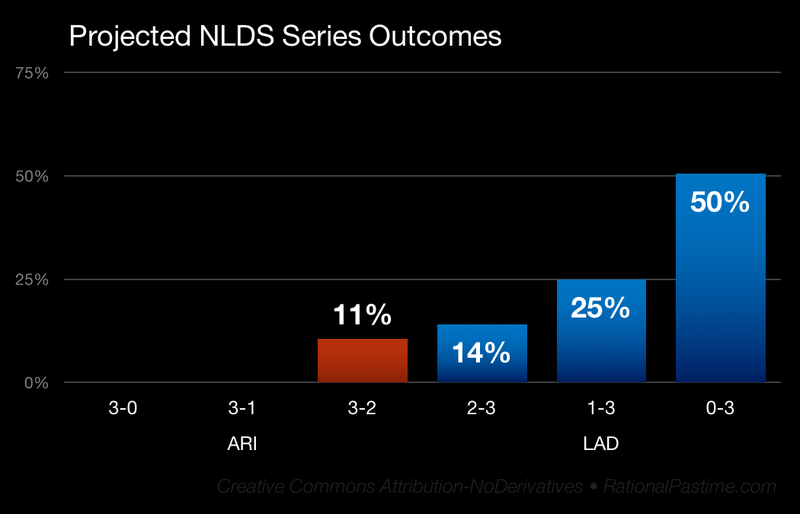 An Indians win over Los Angeles in five games remains the single most likely World Series result. American League play resumes today, with both the New York Yankees and Boston Red Sox facing elimination at home. A sweep in both cases is about a 50-50 proposition. 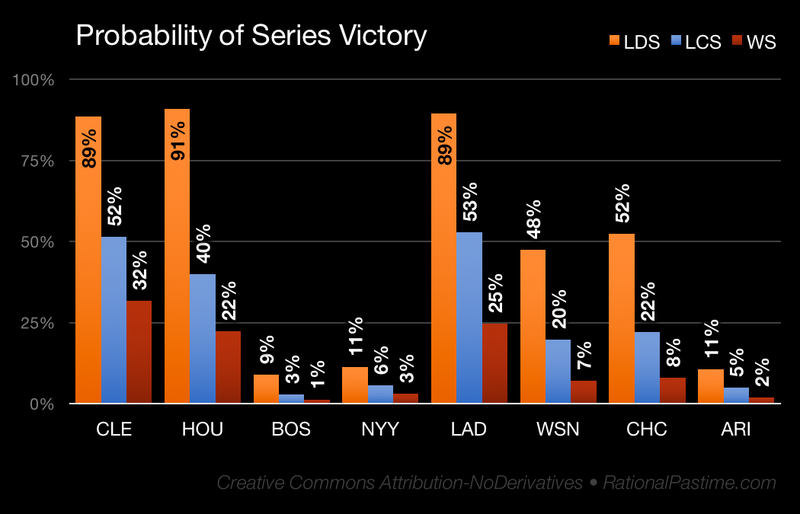 Check back tomorrow to see what the Indians' and Astros' odds are against one another should they advance, or what the underdog's chances are of climbing their way back should Boston and/or New York hold on for one more day.